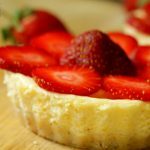 Keto Lemon Cheesecake with Fresh Strawberries - Headbanger's Kitchen - Keto All The Way! I mean, think cream cheese, eggs, and in this case, almond flour for the crust – it’s everything the doctor ordered. This keto cheesecake really hit the spot and satisfied my sweet cravings. I was 80 days into the keto diet when I felt the need to have something sweet. I’ve never been much of a baker and I don’t recall ever having made a cheesecake in my life. My wife, in fact, is the queen of baking, but don’t take my word for it, check out her Instagram account. So she figured out this recipe and made it for me, and that is how we’re here and I’m sharing this recipe with you. To be fair, though, this was one of the first dessert recipes we ever tried out, so it may be a bit rough around the edges. We got better with desserts, like this flourless chocolate cake here, and, our favourite keto berry swirl cheesecake. This is still a classic, though, so try it and let us know how you like it! Does it have to be strawberries? Now I’ve topped my keto cheesecake with strawberries, but a lemon cheesecake is rather versatile and you can switch things up a bit and use different kind of berries. Most berries fall into the ketogenic food category and are fine to consume in moderation. You can even leave it just as is. I also made these cakes in little ramekins but I would strongly advise making it in a cake tin instead. I think a 7″ or 8″ one will suffice. Remember though, the bigger the size the less height your cake will have. This recipe makes 8 servings. Get this recipe on myfitnesspal. A keto friendly, sugar free lemon cheesecake. For the base, melt the butter, add it to the powdered almonds and coconut powder. Mix together and set in the baking moulds. Chill in fridge for 10-15 minutes. Scan I use mascarpone instead of philly and sour cream? I can not find desiccated coconut power, no one has heard of it in the stores. Can I use unsweetened shredded coconut and coconut flour? Today is my Birthday and I wanted to make this cheese can but with out the strawberries I’m thinking about making chocolate goulash and put it on top of the cheese cake. The recipe is amazing. The cheese filling is perfect. I used blueberries instead of strawberries. I cooked them with erythritol and few drops of lime juice. Thanks for the amazing Keto recipes. I tried most of your keto desserts and they are great. Could you please do chewy Keto ice-cream that does not harden in the freezer? Thank you for the kind words Hana. I have been working on an Ice-cream recipe and haven’t been able to make one that I am personally happy with. I promise I will make it as soon as I hit the recipe. Is sour cream a good substitute for the yogurt here? Thanks Cheryl. Are you referring to me using the metric system? If that is what you meant then please do buy a scale, the American way of cups is very inaccurate and especially when you need to calculate macros etc. Having a kitchen scale also helps weigh and portion out food much better. If you don’t want to then in the recipe box there is a converter from metric to imperial. HimSahil, exclllent recipe. 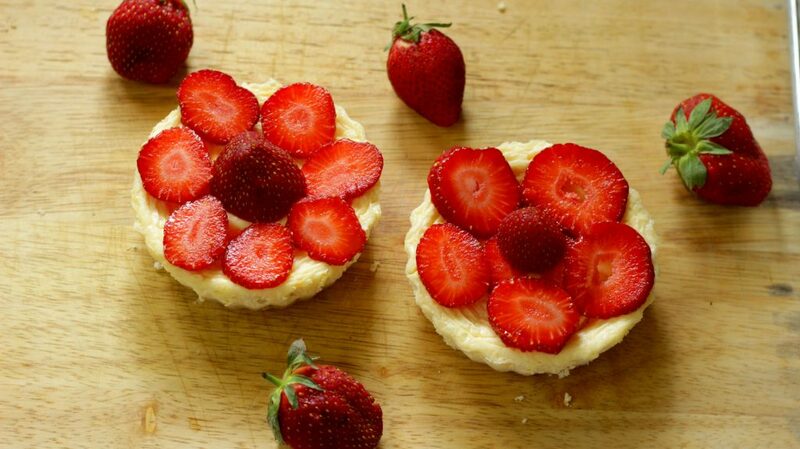 Can i freeze my individual tarts so I can make a few for a treat? Many thanks, love your channel. Gonna buy all your t shirts for my Keto hubbys birthday! Thank you Shazza. You can freeze it but it’s very likely to change the texture of it. Ideally I would recommend keeping it in the fridge it should last for a week at least. If you do freeze it then thaw it overnight in the fridge, that might prevent the change in texture. Hi Sahil, when I followed your recipe exactly I was able to make 6 of these little tartlet in ramekin sizes. I’m a little confused about the serving size and the macros you have put on the recipe above. How many calories, net carbs etc are in each ramekin size please as me and my hubby thinks that they should be more net crabs etc. Btw, my hubby thinks you’re a legend! He’s been Keto for a year and I am just starting. I make all your delicious recipes. You are absolutely amazing when you cook!